Bringing Christ back to Christmas in today’s busy home. Do you wonder if the commercialization or hectic pace of the Christmas season is making it harder each year to celebrate what really matters? Do you wonder if the real message of Christmas is getting lost in the shuffle between parties, gift exchanges, and pageants? Seeking Christmas is a series of family devotions and guided, hands-on activities that give your family meaningful traditions, rich experiences, and treasured memories. 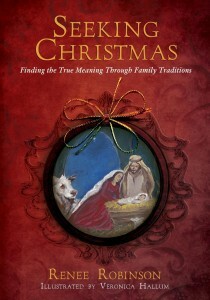 More than just another Christmas devotion, Seeking Christmas is an experience. One that will grow with your family, that you will treasure for generations to come. Seek the true meaning of Christmas, find the gift that is waiting to be unwrapped by you. When you purchase this book, you are helping to change the life of an orphan. 10% of author royalties are donated to organizations that reach out to change an orphan’s life. Seeking Christmas is available at your local bookstore. If they don’t have it in stock, they usually order it free of shipping charges to you. Shopping at your local bookstore is a great way to support your local community.